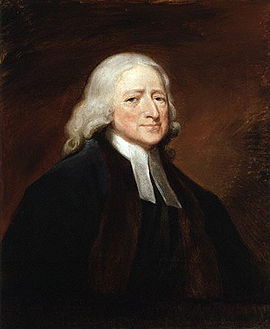 The founder of Methodism, John Wesley, was a priest in the Church of England and never left the Church of England. His intent was to reform the Church and the nation by "spreading scriptural holiness throughout the land." He did not intend to start a new church, but, as it turned out, he did. John Wesley was born June 17, 1703, in Epworth, England. He was the 15th child of 19 born to Samuel and Susanna Wesley. His father was a priest in the Church of England. His mother, a strong woman of faith, was also a strong mother who, with a strict discipline, schooled her children at home. The family was fairly poor; only nine of John's siblings survived into adulthood. Fire destroyed his home when he was only six, and John was the last child saved. His mother is said to have quoted the prophet Zechariah (3:2) when she received John into her arms, "Is this not a brand plucked from the fire?" John grew up with the belief that since he had been rescued, God must have a great purpose in mind for his life. John Wesley was already an ordained priest when, at Oxford, he joined a small group founded by his brother, Charles; it was a group dedicated to serious religious study and discipline. Shortly after that, John emerged as the natural leader of the group. They were very disciplined in their practice of prayer, Bible study, fasting, taking Holy Communion, and social work. After their daily 5 am prayer meeting, Wesley and his group would take food, clothing and their Bibles as they visited the poor and sick and the prisoners in jail. Because of their methodical ways of worship and service, some of the students at Oxford derisively called them "methodists" and "Bible moths." In the evening I went very unwillingly to a society in Aldersgate Street, where one was reading Luther?s Preface to the Epistle to the Romans. About a quarter before nine, while he was describing the change which God works in the heart through faith in Christ, I felt my heart strangely warmed. I felt I did trust in Christ, Christ alone for salvation, and an assurance was given me, that he had taken away my sins, even mine and saved me from the law of sin and death. He hardly mentioned this "Aldersgate experience" again. Yet it seemed to have released him for an incredibly passionate and productive ministry over the next five decades and more. Now John Wesley was full of energy for Christ. He took the message of God's grace to the people where they were. He preached on the street corners and at the coal mines, anywhere he could get a hearing. It was a message of God's mercy and love. Because his message was so personal and the response of the people so enthusiastic, the Anglican authorities became alarmed, and one parish church after another closed its doors to him. But that did not stop him, for as he proclaimed, "I consider the world as my parish." Traveling by horseback, he covered an estimated 5,000 miles a year for over 50 years. Because he believed that nobody should be "triflingly employed" he would often write his sermons while on horseback. After Aldersgate, John Wesley preached two or three times a day. It is estimated that he preached over 40,000 times before he died at nearly eighty-eight years of age. Wesley believed in both faith and works as the means to please God. He helped poor people and young widows find work. He opposed the rum trade and slavery. He wrote a medical manual and made it available to the poor who could not afford doctors. He used money collected from Methodist class meetings to purchase the freedom of persons held in debtors' prison. His Methodist Societies took up the work of teaching poor children how to read. And he set up a factory in which women could work and earn a living wage. His motto concerning material goods was: "Earn all you can. Save all you can. Give all you can. "When he died, he died a poor man because he had given away all his wealth for the cause of Christ. One interesting point about his worship services was that he received the offering first. Everyone either prayed or waited while John delivered the offering to the poorhouse, jail or other needy place. When he returned, the service continued. Thousands of people who came to hear Wesley were converted under his preaching. He became "the soul that over England flamed," through the power of the Holy Spirit. Opposition to his ministry outside the established church only served to intensify the zeal of those who had found new life in Christ. It soon became apparent some kind of organization was needed to bring the people together on a regular basis so that they could be sustained and nurtured in the faith. "Societies" were soon formed. The rapid growth of the societies required more preachers and a closer organization. Wesley chose lay preachers and set them apart to do the full work of ministry, except administering the sacraments. Soon the societies became so large that it was necessary to divide them into "classes" of about a dozen people. These classes met weekly and were guided by a lay "class leader." In Wesley's day, the Church of England had become cold and formal in worship and served mostly just the upper classes. Wesley's practical Christianity was a breath of fresh air for England. His vibrant and relevant faith spread throughout the land especially among the poor and working classes. Wesley's faith-in-action brought practical help and hope to the masses of people. Many historians credit the Wesleyan Revival for helping England avoid a bloody revolution like the French experienced in the French Revolution. Like their leader in England, American Methodist preachers rode from town to town on horseback. They were called circuit riders. They rode the highways and byways of the early United States. They would preach three to four times a week, at up to 20 different hamlets a month. They carried all their worldly belongings plus Bibles and food in their two saddlebags. Circuit riders were on the cutting edge with the pioneers as they moved westward. There is an inspirational story about one early Circuit Rider who rode his route in the southern Appalachians for over 70 years and died, in the saddle, well into his nineties! But most of them died in their twenties and thirties because the life of a circuit rider was so hard and hazardous. The history of the Methodist Church is a story of personal sacrifice to spread the Word of God. Over the years this sacrifice has led some Methodists to leave the Church and form new denominations and churches. One such group is the Salvation Army, founded by William Booth, a British Methodist preacher burning with a passion to help the poor but stymied by a Methodist Church that was overly concerned with order. How sadly ironic that Booth had to go outside of the Methodist Church the way John Wesley had to go outside of the Anglican Church in order to be faithful to the Gospel. The Civil War and the slavery issue divided the Church just as it did the nation. Today, most of the racial divisions have been healed in the United Methodist Church. Nevertheless two historically Methodist African American denominations are still separate from the United Methodist Church though they are closely affiliated with the denomination. Other splits from the past, more doctrinal in nature, are still with us, too. Wesleyan Churches and Universities, Nazarene Churches and Free Methodist Churches all have Wesleyan roots. Over the years many divisions were healed. Then in 1968 the Evangelical United Brethren and the Methodist Church joined together to form The United Methodist Church. The Cross of Christ contains the flame of the Holy Spirit. Created by E.J. Mikula and E.H. Maynard, it was adopted in 1968 as the official symbol for the United Methodist Church. Today, Our Saviour's United Methodist Church is part of the worldwide United Methodist Church. We have been and will continue to be a people with open hearts, open minds and open doors.